It seems that even before the kids got out of school, I got busy. And the blog has been sadly neglected. But I have been busy in a fiber-y way. 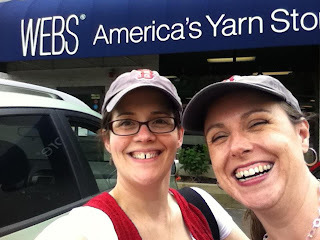 My dear friend Annie and I met up at WEBS (she drove out from Boston, I up from NYC) the second weekend of June for some much-needed Mommy-alone time. Annie had a list, while I just wandered and pondered. But I found the perfect yarn for a women's Deckhand: Cascade Yarns' Ultra Pima, which is lovely and silky and a pleasure to knit. Annie bought a pile in a perfect red (Wine, I think, though it's really just ... perfect red) and some Natural for her stripes, while I went classic with Natural for the main color and Indigo Blue for the stripes and edgings. 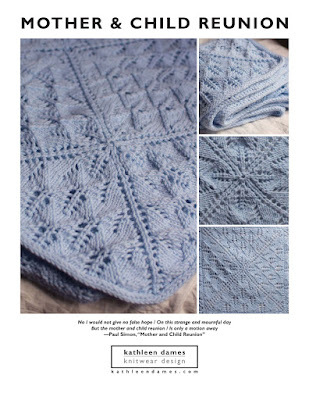 Annie is going to be my test knitter, if I ever get going on the pattern. I swatched and wasn't sure about my chosen needle size, but the yarn blooms a little without losing its silkiness, so US6 may be just right. The children's Deckhand was worked flat and seamed with drop shoulders, but we've been talking in-the-round with raglans for the grown-ups. Something a little more refined. As you can see, we were very excited to get to WEBS! My other WEBS purchase was a skein of tosh prairie (I know lots of knitters don't like single-ply yarns, but I really like this) in Plaid Blanket, which became my travel knitting when we went to see the folks in Door County. I'm inordinately fond of lace projects for traveling: one small/big skein (you know, lots of yardage but compact) and one needle. I made up a shawl pattern that may or may not be finished now. I have to block it before I know for sure, but it was lovely to knit. And the colors were perfect for the woods of Wisconsin: forest green, the gold of fallen pine needles, grey stones, flashes of midnight sky, and that bright green of new cedar boughs. There may also be three sweaters in various states of close-to-done-ness awaiting my ever-wandering attention. One needs a zipper re-sewn in (is there anything less fun than sewing a zipper in a sweater, again? ), another needs the yoke reknit since one skein of yarn ended up being lighter than the other three (see, even "experienced" knitters mess up and should know better than to not alternate skeins in mildly variegated yarn), and the third needs ... something ... again (sigh).